UPDATE: This was an april fools’ prank pulled by the devs as they were implementing last minute changes before the recording second gameplay video. Most people thought it was funny and bought into it for quite a while, until the EULA list, but we would like to point out how ridiculous it would be for a company to impose such rules on their customers. When ACEO is released you can do whatever you want with it, say whatever you want about it and, if you want, refund it all you want. Don’t forget to check out last year’s april fools’ joke here! With an upcoming release of the early access version of Airport CEO we want to update our community on the end user terms regarding usage of Airport CEO, also know as the EULA (End User License Agreement). We have seen an increase in number of so called “Let’s Play” series on YouTube, which of course in most cases is a good thing. However, the quality of the produced material is not always on par with what we believe is the “Apoapsis Studios standard” and in order to give the YouTube viewers the best viewing experience, we feel that it is necessary to constrain what types of Airport CEO videos are being uploaded and control the one who are creating them. This will in general only apply to those who are planning to do a “Let’s Play”, streaming or review video of Airport CEO. When you are purchasing the game you will need to agree to the extend EULA policies which will include instructions how to gain approval for a YouTube upload. We will try to make this approval process as convenient as possible for you so we have put together some guidelines. We also feel that it is necessary to take legal action towards unauthorized uploads! Such legal action may include copyright infringement lawsuits for misuse of the brand Airport CEO and might result in the content creator to upload at least five apology videos! Please note that this action is only in the gamer’s full interest in mind and we have seen it being used very successfully in other titles. While these guidelines are still being developed we have drafted them below. Usually we are interested in hearing your ideas and opinions, but not this time. 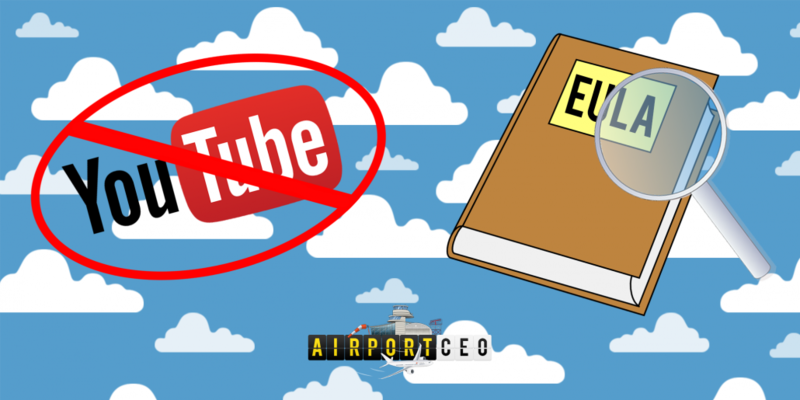 We hope that these guidelines will aid you in creating the best Airport CEO content ever!